A strong contender for single of the year, and it's only february! 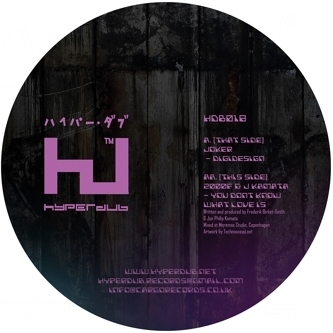 The Hyperdub onslaught for 2009 picks up pace with the blazing hot double header from Joker and 2000F laden with two of the most in-demand tracks in circulation right about now. Both tracks have set the forums alight with excited chatter about the future of dubstep and the possbilities being forged with dubstep's low-rolling bass structures combined with Zapp style lazer-funk synths and voice boxes. It seems everyone is getting seriously hot for 2000F's 'You Don't Know What Love Is', a radical departure from his previous wobbler for the Danish Kraken records and a definite step in the right direction, with a Skwee like attitude applied to a future slow-dance classic, bulging with satin rolled bass and blinding neon Zapp/Parliament keywork that even the most cynical raver will be forced to look cool to. Joker's 'Digidesign' on the flip cuts a more melancholy figure with a gargantuan lead synthline sounding part Far-Eastern futurist-mystic (think Ryuichi Sakamoto's seminal electro cut 'Riot In Lagos') mixed with a knowing UK street-level rave sensibility that's equally Mystical-Futurist, although it probably wouldn't admit it. All we can say is clap your lugs around this beauty and log-in to the '09 programme. It's hot.